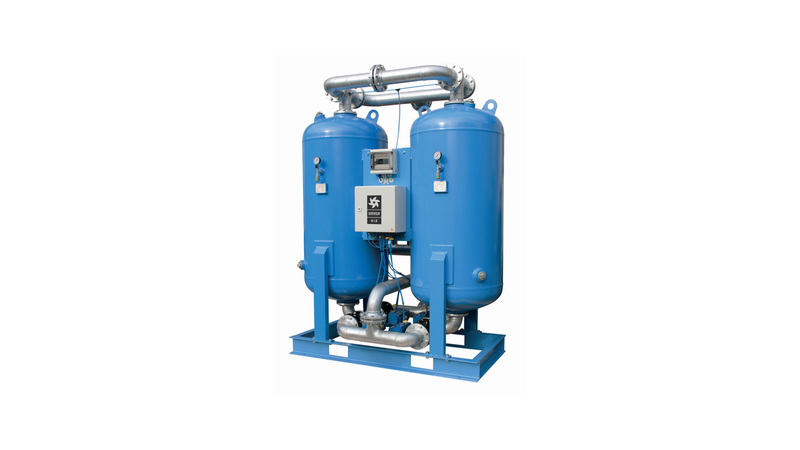 F-DRY adsorption dryers are designed for continuous separation of water vapour fromthe compressed air thus reducing the pressure dew point. F-DRY series dryer consists of two columns, filled with desiccant beds, controller with LCD display, valves, manometers, support construction and suitable filter housings with the required filter element. Adsorption takes place under pressure in the first column whilethe second column regenerates with a portion of already dried compressed air at ambient pressure. When the first column is saturated to a certain level column switch-over is carried out and the process of adsorption continues in the secondcolumn without any drop of pressure at the outlet of the dryer. Regeneration of saturated desiccant is possible because a small portion of already dry compressed air is decompressed and when expanded it becomes extremely dry. This portion of extremely dry decompressed air also called &apos;&apos;purge air&apos;&apos; is then fed through the saturated column in the reverse fl ow direction in order to remove the adsorbed water moleculesfrom the desiccant and release them back to the ambient.